Although most of the Earth’s ozone is found in the stratosphere, pollution created by human activity has brought increasing ozone concentrations much closer to home in the air we breathe. Breathing ozone can irritate and inflame the nose, throat, and lungs, and affect the body’s ability to fight infection. Ozone hurts healthy people, but is particularly dangerous to people with respiratory problems such as asthma, emphysema, and bronchitis. b. the sulfur-laden, sometimes deadly, smogs produced by the large-scale combustion of fuel oil and coal. Both types contain carbon monoxide, carbon dioxide, and a variety of tiny particles, called particulates. Oxidation involves a chemical reaction in which a compound combines with oxygen as it loses electrons to the oxygen bonds. Examples of oxidation include the rusting of iron that produces an iron oxide, and the combustion of fuel that transforms carbon compounds to products that include carbon monoxide and carbon dioxide. Smog often appears as a brownish-yellow to a grayish white haze, with the color depending on the type and concentration of particles and gases. It is found mainly in large cities but rural areas such as those in Wisconsin and Michigan are detecting smog that contains ozone levels exceeding the national health standards. where RO and RO2 are oxidized hydrocarbons. The ozone-producing reaction rate depends on both temperature and the intensity of sunlight. Warm temperatures and intense sunlight favor the production of ozone in the troposphere, so urban areas on hot summer afternoons without cloud cover most often have unhealthy ozone levels. Although the concentration of ozone in smog is too weak to smell, experiments have shown that ozone in a concentration of 15 parts to a million parts of air (ppm) affects plant growth. This level of ozone is often found in the smog of our cities. Research is being done to identify the extent to which this level is a hazard to human health and our environment. Ground-level ozone also is a greenhouse gas, just like carbon dioxide, water vapor, and methane. That is, it absorbs infrared radiation from the Earth’s surface, keeping the atmosphere warmer than it would be without these gases. It is ironic that ozone is detrimental to life at close range, yet beneficial to life when it is far above us in the stratosphere. plants (such as pine trees and mowed lawns). natural sources: bacterial processes in the soil, forest fires, volcanoes, and lightning. 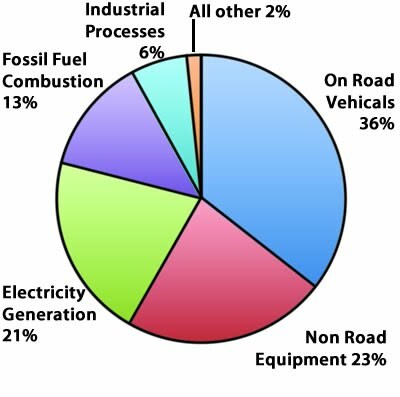 emissions from vehicles and industry. Particulates may form in the air through chemical reactions involving nitrogen oxides or sulfur oxides. 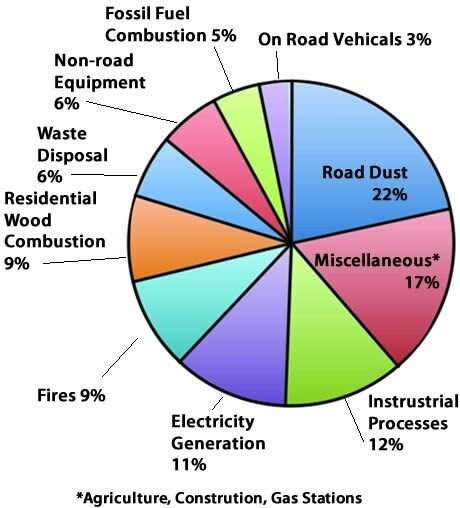 Across Canada, non-industrial fuel combustion, such as smoke from wood stoves, contributes over 75% of the total particulates. In urban environments, emissions from diesel engines, trucks, buses, and large ships, are the primary sources of particulates. Many of the components of smog can be produced by natural processes, but not in the amounts needed to create smog. Excessive pollution by humans has created the ongoing smog problems. Local weather conditions can drastically affect smog conditions. Warm, sunny days generate smog, but rain can remove smog components. Strong winds can disperse smog but smog may still form downwind. 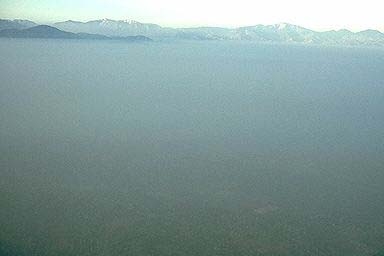 A temperature inversion, where warm air rests above the cooler, denser air near the Earth’s surface, creates a cap that limits vertical motion of the air as it heats during the day, thereby decreasing the dilution of the pollutants to higher altitudes. Often cities in valleys have the greatest problems with smog because the surrounding mountains reduce the winds and temperature inversions can easily develop. Examine the topography of Los Angeles and Denver. Do the surrounding mountains and predominant direction of wind help trap pollutants over these cities? Ozone is used in industry to purify liquids and sewage. Household machines that emit ozone into the air are used to kill mold, mildew, and bacteria, and eliminate odors. Ozone is highly reactive with many types of materials, generally oxidizing the compounds it comes in contact with. Some chemical reactions involving ozone create molecules of OH, which is also a strong oxidizing chemical. Because of ozone’s ability to oxidize many chemicals, prolonged exposure to ozone is quite hazardous to living beings, even at very low concentrations. The federal government and health agencies strongly recommend that people not use ozone-emitting air purifiers in homes and offices. So is ozone near ground level purifying our air? Yes it is, but just a bit too much tropospheric ozone does much more harm to our health than good. Air-polluting technology makes our lives more efficient and comfortable, but as pollution has been “dumped” into the air, it degrades the air quality and directly affects our health. Often the public only responds to catastrophic problems rather than identify problems before they reached critical levels. Efforts to control pollution started in the cities, the areas most at risk, as early as 1881. Both Chicago and Cincinnati attempted to minimize the smoke and soot pollution from home furnaces and train locomotives. National attention was focused on air pollution after several deadly smog events in Los Angeles and Donora, Pennsylvania in the late 1940s. Oregon became the first state to pass air pollution laws in 1952. By 1955 the U.S. Congress passed the first legislation on air pollution issues. In 1963 that Congress enacted the Clean Air Act, in effect today, having been revised in 1970 and 1990. To enforce the Clean Air Act, the U.S. Environmental Protection Agency (EPA) established standards and programs to protect public health, the environment, and the quality of life from the detrimental effects of air pollution. The responsibility for regulating sources of pollution was divided: state and local governments regulated pollution from power plants, factories, and other “stationary sources,” while the EPA regulated the “mobile sources” of pollution that include cars, trucks, buses, and aircraft. The 1990 Clean Air Act Amendments required increased monitoring of ozone, hydrocarbons and nitrous oxides in areas with persistently high ozone levels, mostly large metropolitan areas. The air monitoring sites are called Photochemical Assessment Monitoring Stations (PAMS) which collect hourly measurements of nitrogen oxides, ozone, meteorological data, and 56 different volatile organic compounds, 24 hours a day during the summer months of June through August. Monitoring Stations are set up in four different locations relative to the major sources of pollution. Sites located upwind of the pollution sources provide information on the “background” air quality to make sure additional pollution is taken into account and not attributed to the known sources. Sites immediately downwind of the area of primary pollution measure the amount and type of chemicals being emitted into the air. The third type of site is located in the area of expected maximum ozone concentration, which is 16 km to 48 km downwind from the fringe of the urban area. A fourth type of site is located far downwind of the metropolitan area, to identify ozone movement into other areas. These data are helping the EPA and other atmospheric and environmental scientists to better understand the processes of ozone pollution, to devise effective remedies, and to measure the environmental response to clean up efforts. Has there been recent catastrophic loss of life due to air pollution? No, mostly any increase in death rate due to effects of pollution is a very gradual thing. Is the air safer now than when government efforts were started to clean up the air? Yes and no. The EPA’s vehicle emission control program was designed to reduce nitrogen oxide and hydrocarbon emissions, two critical elements of smog. Cars produced in 2000 emit 70% less nitrogen oxides and 80% to 90% less hydrocarbons compared to the cars of the 1960s. However, the number of cars on the road has doubled and the number of miles being driven by each car per year is increasing. Population growth has been focused in urban and suburban areas, concentrating the pollution from cars. 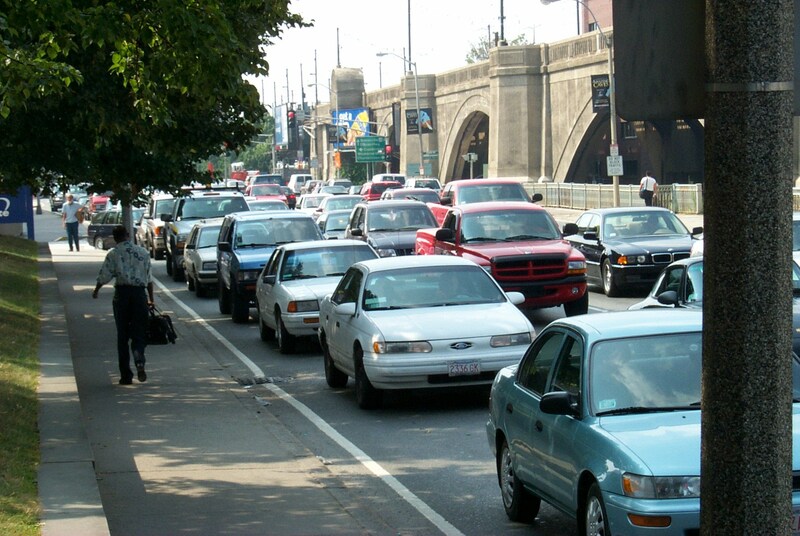 Increasing number and duration of traffic jams also focus the pollution into smaller areas. Pollution control also costs money to maintain. Many people owning cars simply do not maintain them. Today a relatively small number of “super-dirty” cars produce a major portion of ozone-forming hydrocarbons. 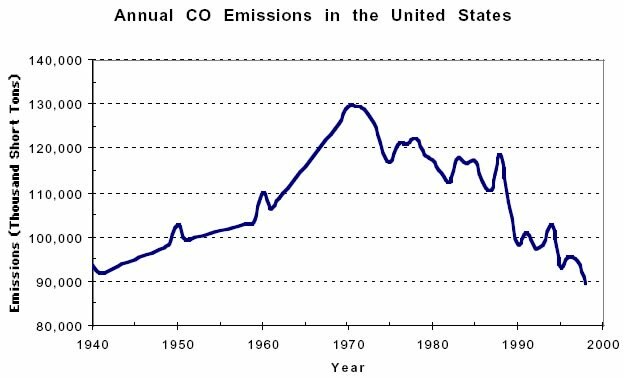 The problems of air pollution have not gone away, but imagine if our car emissions had not decreased from those of 1960 while the number of cars and miles traveled per car doubled! Our problems would be considerably worse. In 1983, the concentration of ground-level ozone in the New England region exceeded the health standards on 90 days of the year. By 1999, ozone levels exceeded these standards 35 days of the year. Is this improvement enough for the health of our environment and ourselves? 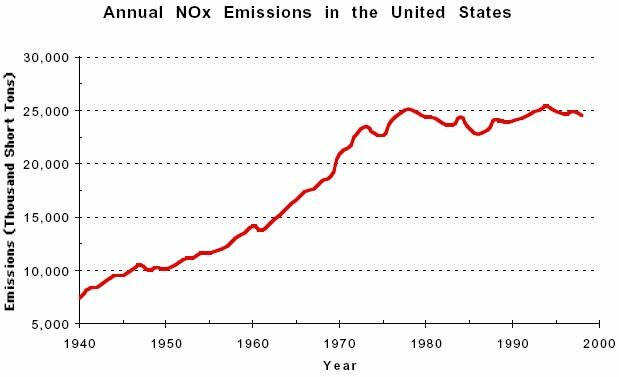 Examine the three graphs of chemical emissions in the United States from 1940 until 1998 that follow, and decide for yourself. 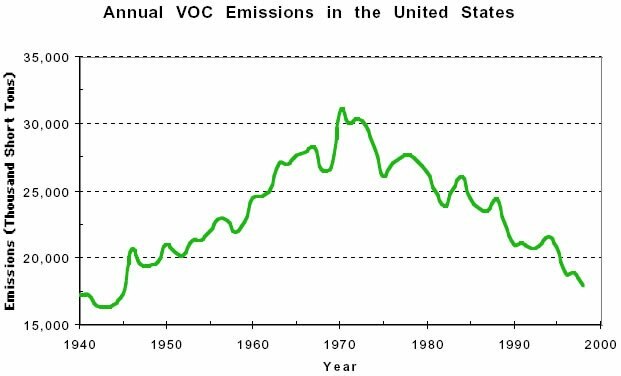 These data are annual emissions of pollutants by the United States, a developed industrial country. Consider the trends of emissions from developing countries as they develop their industrial capabilities over time. Projections into the future must account for economic growth, expanding industrial production, increasing population, and expanding consumption. As you can see progress has been made, but more can be done to prevent pollution as well as recover our air quality to healthy levels, especially when you factor in future industrial, economic, and population growth. Governments, societies, and individuals must work together to make a difference. Laws aren’t enforced unless supported by society and individuals. What can be done? First, know your technology. One way to fight pollution is to know how different types of Promising Innovations technology work and what amounts and types of pollution are associated with each. An example is to compare the emissions from engines used in car and power garden tools. Four-stroke engines, like those used in cars, use separate cycles of the cylinder to add fuel to the cylinder and to exhaust the combusted fuel vapors from the cylinder, which minimizes the amount of fuel that remains uncombusted. Even with this efficient technology, these engines are responsible for a significant proportion of the total emission of ozone-generating components due to the sheer number of automobiles and the number of miles driven. Two-stroke engines, used in lawn mowers, leaf blowers, mini bikes, outboard motors, jet skis, and small backup electrical generators, input fuel and remove combusted fuel vapors from the cylinder at the same time. Because of this simple technology, these engines release up to 25% of their uncombusted fuel in their exhaust, creating significant smog-producing, health-impairing emissions of volatile organic compounds. In addition, moving parts of the two-stroke engine are lubricated by mixing the engine oil with the gasoline. This oil is more difficult to burn completely than the gasoline, and the exhaust produces up to 10 times the amount of particulate matter than four-stroke engines. Why are these engines still used, given these pollution problems? Two-stroke engines are very simple in design, easy to maintain, low cost, lightweight, and actually the most powerful engine for its size. Therefore, two-stroke engines are quite popular, resulting in widespread use of the engines. In addition to cleaning up technology, additional measures can be taken that involve the timing of emissions while waiting for cleaner technologies to be developed. In a sense, spread out the pollution over time so that the concentrations cannot reach critical limits to be harmful. Remember that temperature and the amount of sunshine are important factors in generating ozone and smog, so if certain emissions can be delayed until cooler, cloudier conditions are expected, air quality would benefit. The city of Windsor, Ontario, Canada, and community action groups created a list of ways to spread out pollution to minimize their smog problem, which can be quite severe. Part of the problem is out of their control: 50% of the pollutants that make Windsor’s smog come from sources of pollution in the United States. But the 50% they can control can limit the formation of smog. On days that smog might form, consider the following actions to minimize the severity of smog and/or prevent the formation of smog. 1. Suspend road paving that can release hydrocarbons into the air. 3. Suspend the use of oil-based paints, solvents, cleaners, and other products that release volatile organic compounds (VOCs). 4. Suspend spraying pesticide/herbicide that contain VOCs. 6. Consider road closures to discourage use of automobiles and encourage other forms of transportation. The EPA is focusing on controlling hydrocarbon and nitrogen oxide emissions as the best strategy for reducing ozone levels in most urban areas. Despite continued improvements of car emission control systems, volatile organic compound emissions from gasoline-powered vehicles will likely increase after 2005 as the number of vehicles and miles traveled continue to increase. To protect our air quality, we must significantly reduce the use of cars or begin using alternative fuels that produce cleaner emissions than gasoline. It wouldn’t hurt if we did both. • safety—how likely the fuel could ignite during storage, refueling, or a crash? • is the unburned fuel hazardous to human health? • what happens during a spill: will the fuel evaporate, mix with water, float on water? • how easily can the fuel be used? Some require little modification to be used by existing engine technology, whereas others require completely new engines to be designed and mass produced. • maintenance costs—the fewer the emissions, especially carbon compounds, the longer the engine will remain cleaner, keeping maintenance costs lower. • volume of fuel that must be stored to allow the car to travel an adequate distance between refuelings—the “energy density” of the fuel. • is the fuel a renewable resource, or is its supply limited based on natural deposits of the material, as is the case with gasoline. Refueling during evening and nighttime hours in the summer can decrease the amount of gas that evaporates because of the cooler temperatures. Photo by John Pickle. Some of these alternative fuels are currently in use, or have been used in a minor capacity for quite a long time. Others involve cutting-edge technology. Regardless of their current stage of development, alternative fuels will have an important role in decreasing the amount of pollutants we emit into the air.